GRE students are a diverse group. “Non-traditional” students are the tradition in GRE preparation. Whether you’re a working parent, a recent college graduate, a professional seeking an advanced degree, someone seeking a career change, an academic, or any combination of the above, you will fit right in with other GRE students. One of the greatest challenges for people with existing responsibilities is to find the time to prepare successfully for the GRE while staying on top of your job, family, application process, and all the complexities of life. In this post, we’ll discuss a step-by-step approach to success with the GRE using readily available resources. How much time do you need to prepare for the GRE? Depending on your schedule and existing skills, you may be able to prepare for the test adequately in as little as a month. On the other end of the spectrum, six months might be ideal. Either way, you must map out a schedule in advance from the beginning of your preparation until the time you plan to take the test. Let’s say you have three months to prepare for the GRE. Check out our free 12-Week Study Plan. This plan breaks down your preparation into discrete and manageable components. Following a plan also creates accountability. Check off your progress to make sure you’re staying on track with your work. Sometimes we get so swamped with work or other responsibilities that seemingly “optional,” self-directed work such as GRE preparation can take a backseat. To make up for lost time, students sometimes cram a lot of preparation into a weekend or day off when they have a chance to catch up. Cramming does not work for the GRE. Slow and steady wins the GRE race. Take thirty minutes every day to work on the GRE. Check your schedule and set a goal for the day. It might be to study an unfamiliar math concept. It might be to work on your Analytical Writing essay. You do not need to do everything at the same time; instead, if you’re able to achieve small goals, you will be well on your way to success on the entire test. When can you find these thirty minutes? Consider waking up half an hour early, using your lunch break, while your kids are doing activities, right before you go to sleep. Commit to making one thirty minute block every day. If you don’t have even thirty minutes to spare, mix in some vocabulary practice throughout the day. Use days when you have more time to take the practice tests and work on bigger tasks. The GRE is a “skills-based” test. This means that the GRE is designed to test your reasoning skills. Yes, there is required core knowledge. You must know the math fundamentals. You must master the core vocabulary. However, as you master these fundamentals, you must practice effective test-taking skills for the GRE. These skills include finding alternative approaches to math problems, using process of elimination on Verbal problems, predicting the answers, and looking out for traps. The best way to improve your test-taking skills is to review and repeat your work. Identify your strengths. Identify where you make mistakes. Go through the process of doing the same problems without repeating mistakes. Do the same problems over again using alternative approaches to illustrate multiple possible paths to the right answer. Analysis and repetition are as important as doing the problems to begin with. This is true for the practice tests as well. Doing problems without review will not get the results you deserve. Studying the fundamentals and doing practice problems is helpful, but there is no substitute for the real thing. The first step in your preparation should be to set aside three and a half hours to take an official ETS PowerPrep GRE practice test. There are four official practice tests available. The first two are free. The second two are forty dollars each from ETS. You should plan to take at least two practice tests before your actual GRE, and ideally you should plan to take all four. These practice tests enable you to get hands-on experience with the test interface and test experience. Doing the practice tests will also help you build the endurance necessary to take a lengthy standardized test. Take these tests in a library or another quiet, public facility. Some people stay late and use their work computers. The key is to use a desktop PC with a full-sized keyboard and mouse. This is the interface you will use in the testing center. Have scratch paper and pencils handy to do your work (in fact, all your GRE work should be done on scratch paper to simulate the computer-based test experience). 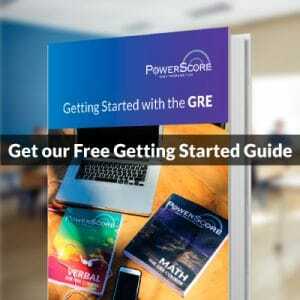 In the above discussion, we brought up several helpful, free tools PowerScore offers for GRE preparation. We also linked to ETS’s GRE practice tests. More resources are at your disposal. Visit our Free GRE Help Page. 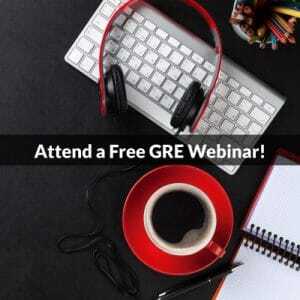 As your work continues and you have questions, register for our Free GRE and Grad School Admissions Forums and ask questions to receive prompt, expert replies. If you’re a student who benefits from a more collaborative, structured preparation approach, consider registering for one of our GRE classes. We hope you find these pointers helpful and look forward to seeing you on our forums!